The Runway website is fully modular, it can grow with your business and budget. Launch with the basic landing page now and extend it with the Pages extension when you're ready. The Runway is 100% mobile friendly and can be viewed on any device. You can be assured that your website will be appealing to your visitors and convert more leads. One of the most effective way to get your website more traffic is to have a strong social media prescence. Social media is a priority with this package. The site links visitors to your Facebook, Twitter & Google+ pages and as you grow your social media presence it's a simple one step process to add new links. It's common knowledge that the higher your ranking in search engine results, the more visitors your website will receive. The Runway is schema.org friendly, so Google and other search engines can source addresses and phone numbers from the website. Additionally we pre-install one of the best SEO optimisation plugins on the market into your website to help you with your SEO. We’ll help you get the most out of your website by integrating with both Google Analytics and Google Search Console so that you can always see who is visiting and how you can improve. The Runway comes with fast, secure and reliable Australian cloud based website hosting for just $30 per month. Alternately you're free to host the site with another provider. Every client is special to us. We pride ourselves on a personal touch and high standard of customer service. After launch you will receive training for your website and we're always happy to answer any questions by phone or email. If you already have your logo and website content ready, we can have your new website online in no time at all! Prepare your business for take off with Web Bird Digital’s latest business package. The Runway is a fully responsive WordPress based small business website package which grows with your business. Start with a simple one-page website and add features as your business ascends; or start in-flight with a fully loaded website. Launch your business to the cloud with The Runway. The Runway is a modular website. In it’s most basic form it is a landing or lead page. Adding a few of the below extensions adds new functionality to the website such as a showcase of your services, image galleries and the ability to add pages and posts, transforming it into a complete website. As a landing page, The Runway starts from $999*. This is suitable as a secondary website to highlight a product or service, or as a placeholder website for a startup. As a basic lead-generating website, The Runway costs $1,749*. This includes the Pages, and Services extensions. 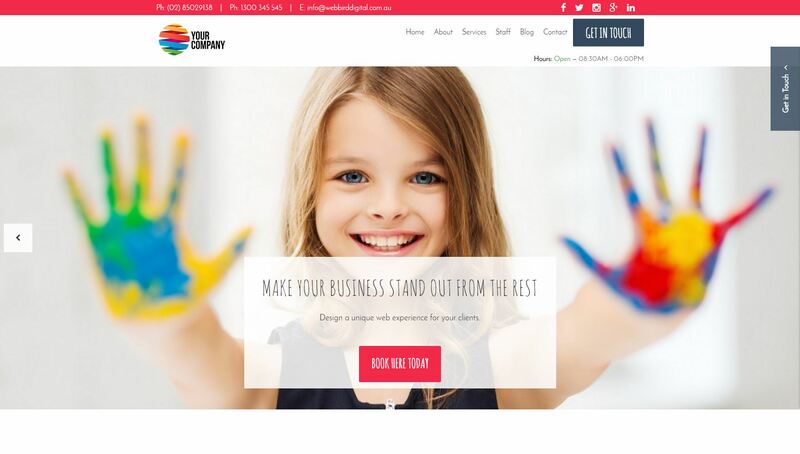 This is perfect for Tradies or small business owners looking to get started without the initial expense that comes with most websites. The fully featured version of The Runway starts from $2,499*. This includes all of the features of the above, plus the Pull-out Sidebar, Feature Boxes, Image Gallery, Testimonials and Map extensions. *All prices quoted are excluding GST and subject to change at any time without notice. Listed prices are indicative only, please contact us for a quotation. This extension transforms The Runway from a single web page to a full web site. This adds support for multiple pages and blog posts as well as integrates with the services and testimonials extensions providing a link to each item's own page for more details. This extension allows you to showcase your business' services. This includes a section on the home page, a shortcode to display the services and single pages for each service (with the Pages extension). What better way for customers to find you than with a map? This extension allows you to embed a custom Google Map into your website. The map can even be styled to suit your brand's colours. The Testimonials extension allows you to showcase what people are saying about your business. The pull-out sidebar allows you to hide more content off the edge of the screen. Normally used to position the contact form in an easily accessible location but can also be used for any other content. These can be used to format any content in a simple and elegant layout. This could be used to showcase your services, staff or galleries. The Accordion extension for The Runway permits display of content in hidden drop-down boxes. Commonly used for FAQs this helps to format large amounts of text in a simple, readable format. See a similar system in action on our FAQs page. The Trading hours extension allows you to showcase your business' trading hours to your customers. This allows you to display your trading hours on the image slider, in your content as well as your store's current open/closed status on the website's header.